An enjoyable trip that includes all Zorro's movies, from Douglas Fairbanks to Antonio Banderas with interesting comments of fencing and whip handling trainers. Includes interviews with Banderas, Anthony Hopkins and Catherine Z. Jones. Freshness Of Treatment For The Cinematic "Robin Hood Of California" Will Win Approval From Zorro Enthusiasts. 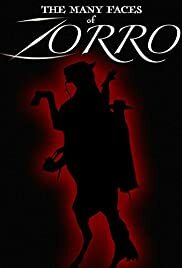 Johnston McCulley's valourous creation, Zorro, is the subject of this engrossing documentary that depicts the double-lived gallant throughout his various media appearances. McCulley was fascinated by legends of early California that, in combination with his fondness for Baroness Orczy's Scarlet Pimpernel, formed a basis of Zorro's clash against injustice initially set within Spanish ruled California in the 1820s. McCulley's first Zorro piece, "Zorro Rides Again", appeared in the October 1918 issue of Argosy All-Story Magazine and, soon after, Douglas Fairbanks, who also wrote the script (as Elton Thomas), produced, and starred in THE MARK OF ZORRO, playing as foppish Don Diego Vega during daylight hours, then becoming the masked Zorro (Sp., "fox") in the evening, a superior swordsman graced with a social conscience, who trounces all of his physical competitors, utilizing the familiar Fairbanks brio as seen here in numerous clips. This 1920 film became a substantial commercial success and the documentary presents a large selection of its successors' footage, culled through by the able production corps. Among these are the Fairbanks vehicle DON Q, SON OF ZORRO, released in 1925, during which the acrobatic star performs as both father and son, with the setting in Spain and in California; the first sound era Zorro picture, BOLD CABALLERO, featuring Robert Livingston; the outstanding 1940 THE MARK OF ZORRO, with Tyrone Power as lead, although Twentieth Century Fox wanted unavailable Errol Flynn (contracted to Warner Brothers) for the part; the Alain Delon 1975 ZORRO, a continual European favourite; the appalling spoof, ZORRO THE GAY BLADE, with George Hamilton; and a bevy of Republic serials, some with uncommon themes, beginning with the 1936 release of THE VIGILANTES ARE COMING, with Livingston cast as Zorro. Many other samples of the Zorro motif in serial form are here, for the greatest part taken from trailers, and we view such as John Carroll, Reed Hadley, George Turner, Clayton Moore, and Ken Curtis in the role of Zorro or an imitation. Although many of these serial efforts are largely uninspired, they could be relied upon for solid box office revenue. The best-known of recent Zorro affairs, THE MASK OF ZORRO (1998) is puffed here by brief interviews with that film's stars, Anthony Hopkins, Antonio Banderas, and Catherine Zeta-Jones. The work's narrator points out that soon after Walt Disney licensed the rights to the Zorro character in 1952, his studio made a star of Guy Williams in Disney's highly popular television series, "The Sign of Zorro", that generated a renascence of cinematic adventures relating tales of the legendary hero, made during the 1960s and 1970s in Europe and Latin America. An intriguing postulate of the documentary provides for evolution by the Zorro icon, that includes his double identity, into radio's "The Shadow", in addition to such as Batman, Superman, Captain Marvel, and a wide range of like heroic figures of fantasy. The documentary occupies the greatest portion of an ably produced two hour DVD package from Passport Video, and its narrative that relates of the moralistic stories of Zorro is informative and never less than interesting. Amid the other segments included upon the disc are a pair of items dealing with a particularly worthy theme, one that will be of especial interest to many viewers, incorporating interviews with, and lengthy demonstrations from, "Sword Master" Tim Weske and "Whip Master" Anthony De Longis, each of whom adeptly illustrates in some detail his specialty weapon. Some viewers may be startled to learn that the tip of a cracking whip travels at over 700 miles per hour!